Nazaré, Portugal (Friday, November 16, 2018) – Two-time Big Wave Tour Champion Grant ‘Twiggy’ Baker (ZAF) won the World Surf League (WSL) Big Wave Tour (BWT) Nazaré Challenge today in incredible 25-to-40-foot surf at the infamous Portuguese big-wave venue of Praia do Norte, Nazaré. The event launched early this morning in glassy conditions with 25-foot-plus wave-faces around the high tide mark and as the tide dropped conditions got heavier and heavier to culminate with large surf in the 35-to-40-foot range, with occasional larger sets. Mike Parsons, Big Wave Tour commissioner has granted this event a Silver coefficient, meaning results in Nazaré will carry a 10% increase in points (e.g. 11,000 points for the winner). A relatively discrete surfer in the opening round and the Semifinal, advancing in third place in both heats, the South African from Durban peaked at the exact right time to pull off some of the most incredible drops and rides seen all day in Nazaré during the Final. The tall and powerful regular foot went both to his forehand and backhand in the Final to score an incredible 8.67 and 7.70 on his way to a first victory in Portugal. The 2013 and 2016 Big Wave Tour Champion, Baker has time and time again proven to be a threat in all conditions when the waves hit maximum heights. 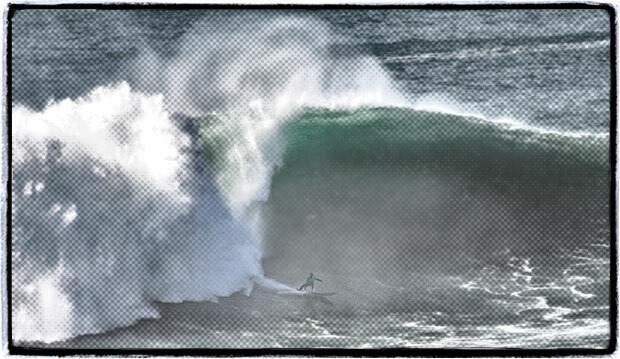 Today he came out on top of one of the best days of big wave professional surfing ever seen. The Final got underway quickly with good rides from most surfers, but undoubtedly Lucas Chianca (BRA), the defending event champion in Nazaré, got the better of the early exchanges. The young Brasilian posted a 7.17 and 6.23 to take a strong lead early on and continued to play with the massive lefts he’d been dominating since early this morning. His ability to drop late into the steep walls impressed as he navigated some of the best waves of the day. Baker answered with good lefts at first, going back up into the wall to score turns on the shoulders for his first two scores. He then switched to the rights, to pull two huge drops into shorter rides to continue to build momentum. Natxo Gonzalez (EUK) waited 30 minutes to start on his first wave, but his patience paid off as he launched into one of the most critical rides of the Final to post an 8.17 and position himself in second position. João De Macedo (PRT), Russell Bierke (AUS) and Alex Botelho (PRT) had a slower start to their heat and kept chasing waves. Gonzalez moved into the lead with a second left quickly after, but Baker replied with a huge wave on his backhand, threading the face in a perfect line to post an excellent 8.67 and move ahead of the Basque surfer, relegating Chianca to third. The Brasilian found an excellent wave of his own to move into second with an 8.07. The last three surfers started getting better waves in the 6s and 7s to stay in fighting distance of the lead while Baker, Chianca and Gonzalez continued to surf their own heat. But as time ran out, the situation remained unchanged and Grant ‘Twiggy’ Baker walked away with the win, closely followed by Chianca and Gonzalez. Botelho claimed fourth place, De Macedo fourth and Bierke fifth in his first-ever Big Wave Tour event. In his second year on the Big Wave Tour, Lucas ‘Chumbo’ Chianca (BRA) dominated his first two heats to qualify for the Final, and score the second-best single score of the day, a near-perfect 9.60 for a backhand barrel in Semifinal 1. Unfortunately the Brasilian couldn’t quite find the same opportunities for massive scores in the Final heat and placed runner-up behind Baker. 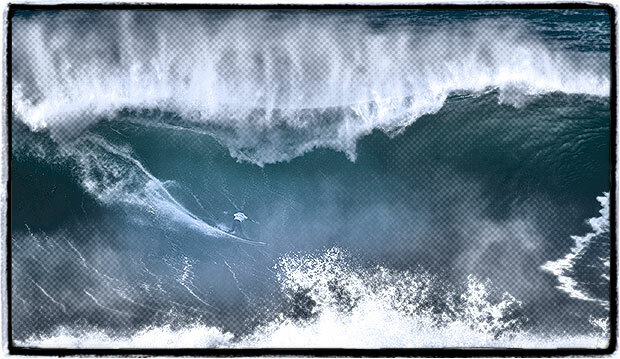 Third place finisher Natxo Gonzalez (EUK) had previously ridden the wave of his life in Semifinal 2, locking in a deep barrel with a high line on an impressive lefthander that came up abruptly next to the cliffs. The Basque surfer is building himself a solid profile on the big wave scene and will be one to watch as he takes on his first full season on the tour. Competition reached a climactic high in the Semifinals as waves started opening up, giving surfers a rare opportunity to get barreled at Nazaré when the waves are that big. Portuguese surfer João De Macedo was the first to capitalize with an impressive 9.20, Chianca followed with a 9.60 and Gonzalez pulled off the impossible with his perfect 10 point ride in the following heat. Last year’s Big Wave Tour Champion Billy Kemper (HAW) bowed out in Semifinal 1 alongside compatriots Nathan Florence (HAW) and Ian Walsh (HAW). The 2018/2019 Big Wave Tour hosts three events: the Nazaré Challenge, the Jaws Challenge, and the Mavericks Challenge. All holding periods for this season are now open and will await the biggest waves until the season’s close on March 31, 2019. For the Jaws Challenge and Mavericks Challenge, the world’s best male and female big wave surfers will await conditions that will produce waves in the 30-to-60-foot range. Once the decision is made to run the event, a “Green Alert” is issued and competitors will have 48 hours’ notice to be ready to compete.